Reference: Leypold T2, Davenport 1151, Hafner 32a, KM-22 (listed under Austrian States, Burgau). Obverse: Bust of Maria theresia right, large mint master’s initals initials (S.F.) below. Legend: M . THERESIA . D . G . R . IMP . HU BO . REG . 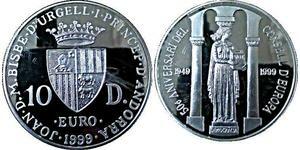 Reverse: Crown above double headed imperial eagle, large multiple coat of arms with three crowns and lion. 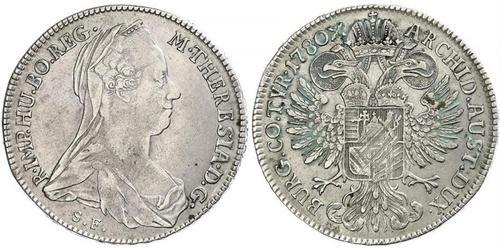 For your consideration a scarce example of the famous Maria Theresa Thaler, struck posthumously at the Gunzburg mint in Germany during 1792-1805. This example is one of the early and sought after issues with lower mintage numbers. Some of the differences to the recent re-strikes are the eagle’s wing-feathers, the brooch without pearls, the hair-style and the date shape. 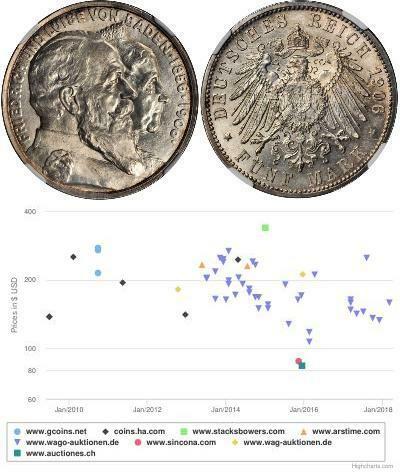 The Maria Theresia Thaler was one of the first coins used in the United States and probably contributed, along with the Spanish dollar, to the choice of a dollar as the main unit of currency for the United States. Maria Theresa (German: Maria Theresia, see also other languages; May 13, 1717 â€" November 29, 1780) was a reigning Archduchess of Austria, a Queen of Hungary and Bohemia, and a Holy Roman Empress. Maria Theresa was the oldest daughter of Elisabeth Christine of Brunswick-WolfenbÃ¼ttel and Emperor Charles VI, who promulgated the Pragmatic Sanction to allow her to succeed to the Habsburg monarchy. Opposition to her acceding to the throne led to the War of the Austrian Succession in 1740. After Emperor Charles VII, who claimed the throne, died in 1745, Maria Theresa obtained the imperial crown for her husband, Francis I. Though she was technically empress consort, Maria Theresa was the de facto ruler of the nation, and she began styling herself Holy Roman Empress in 1745. Maria Theresa had in fact already begun her rule in 1740 during the Austrian War of Succession. Maria Theresa helped initiate financial and educational reforms, promoted commerce and the development of agriculture, and reorganized the army, all of which strengthened Austria’s resources. Continued conflict with the Kingdom of Prussia led to the Seven Years' War and later to the War of the Bavarian Succession. She became dowager empress after the death of Francis and ascession of her son Joseph as emperor in 1765. Maria Theresa criticized many of Joseph’s actions but agreed to the First Partition of Poland (1772). A key figure in the power politics of 18th century Europe, Maria Theresa brought unity to the Habsburg Monarchy and was considered one of its most capable rulers. Her 16 children also included Marie Antoinette, queen consort of France, and Leopold II, Holy Roman Emperor.